As urban regions face the demand to decrease fossil fuel dependency, many cities in the developing world are undertaking initiatives designed to create a greener city by aiming for a more sustainable form of urban development and, to do so, they need to evaluate existing modes of transportation and patterns of land use. Focusing on Oslo, an early leader in urban environmental policy making and a European 'green city' award winner, it argues that this evaluation must adopt and integrate two approaches: firstly, as a process of ecological modernization based on a combination of transit, densification, and mixed use development and secondly, as an opportunity to reconsider the character and substance of the built environment as a reflection of natural values, landscapes and natural resources of the wider region. 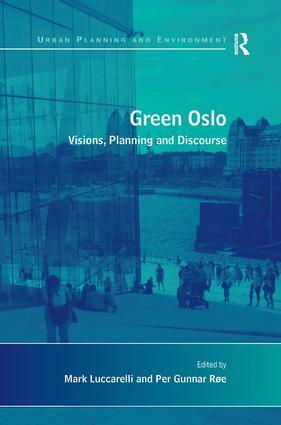 Environmental debate and concern is widespread in Oslo, and this is reflected in its earlier planning decisions to leave intact large forest reserves, its successful ecological restoration of the Oslo fjord, the importance of outdoor culture among its residents, the relatively progressive political agenda of Norway, This book provides an opportunity for a critical assessment of the limitations and opportunities inherent in 'green Oslo' and suggests the need for much broader integrative approaches. It concludes by highlighting lessons which other cities might learn from Oslo. Mark Luccarelli is an Associate Professor of North American Studies at the Department of Literature, Area Studies and European Languages, University of Oslo, Norway and Per Gunnar Roe, Associate Professor of Human Geography, Department of Sociology and Human Geography, University of Oslo, Norway.